The 2018 Racketball Club Championship took place on 17th September. John Dewis won his 5th title beating Langton Takiwira a previous winner. · Racketball/Squash57 Detox in January 2019. · Racketball/Squash57 Club Championship in April 2019. · Racketball/Squash57 OPEN Championships in September 2019. My sincere gratitude to our sponsors, Oneleisure and Moore Performance (Physiotherapist) for their help and support. The 2017 Racketball Open washeld on Saturday September 23rd. Byron Williams would like to extend his gratitude to the sponsors. Chris Keeble (One Leisure St Ives), Will Moore (Moore Performance (Physio)), Danny Caulkett (St Ivo Squash Club). The prises donated were appreciated by the players. The 2017 Squash 57 Championship (the new name for Racketball) was held on Monday 24th April at 7.40 pm. Thanks to Byron for organising and everyone who took part. The 2016 St Ivo Racketball Open was held on Saturday 17th September. Report follows. The St Ivo Open Racketball was quite a success. We had 18 contestants, up this year by 3 compared to last year. We had a total of 41 matches; Senior A, Senior B, o50s, and Ladies entry. Senior A winner - Daniel Soar, Peterborough, Runner Up - John Dewis, St Ives. Senior B winner - Tim Booth, Boston, Runner Up - Tim Millington, Peterborough. O50s winner - Andy Ruff, Peterborough, Runner Up - David Clark, Peterborough. Ladies winner - Katie Price, Boston, Runner Up - Tanya Ruff, Peterborough. There are so many supporters that had helped to make this event happen. Would like to thank and mention a few: Mr Chris Davidson and his team from OneLeasure, Kat, Tom, Sarah, and Radford. Vicky was very supportive and helpful on the day. My thanks also to Rennie Kapila, The Sports Injury Clinic St Ives, UK-Racketball, and England Squash. Once again thank you all and I look forward to your support next year. A closed Club Championship competition is held every year; this is a good time to experience competitive play against other club members. The 2014 event will be held on Thursday 16th April. The St Ivo Racketball Open competition is held each September and attracts players of all standards from around the region. The 2016 St Ivo Racketball graded open takes place on 17th September 2016. Entry form. Poster. We also hold a Christmas Detox racketball competition, in late December, with the emphasis on having fun and losing a few of the pounds put on over the festive period. The 2015 Racketball Club Championship was held on the 16th April 2015. Report. The 2014 St Ivo Racketball Open event took place on Saturday 20th September 2014. Report. The 2014 Racketball Club championship was a well-contested tournament. Notable matches included Derek's match against Glanville and Alistair and Matt's match. The final topped them all with John beating Matt 3-2 in a 90 minute epic. The 2013 Racketball Club championship concluded on the 25th March. This year sees a new upcoming senior winner to put on the Racketball trophy. Matt Dixon is our new Racketball Club Champion 2013, but not without some fierce challenge on the second day by Danny Caulkett and Howard Mitchell. Danny fought hard to keep his 2:1 lead in the 3rd but Matt came back with such determination and focus to take the 4th and 5th game from the tiring Danny. Howard managed to get the 3rd place and young Adam Weir came in 4th place. The ladies winner is Helen Kemp.The overall event was carried out over 2 days and this year we saw as many as 5 of our Racketball players injured due mostly to the long cold winter weather. Byron would like to express his gratitude to Oneleisure for their help and support with courts and prizes. Thanks to Byron for organising. 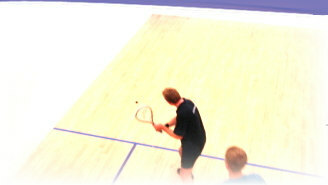 The 2012 St Ivo Racketball Open took place on Saturday 22nd September. We had 30 competitors consisting of: 6 ladies, 6 Juniors, and 18 Senior Men. Thanks to ESR East & UK-Racketball for their help and support, and thanks especially to Byron for running the competition and all the great competitiors for taking part. Thanks also to Tony Gay and Derek Darnell for sponsoring the event. The One leisure Centre were a great help too in providing some prizes. Results for the 2012 St Ivo Racketball Open. The 2011 St Ivo Racketball Open attracted some of the best Racketball players from around the region - Report. Sunday 20th September saw the St Ivo Racketball Open 2009 take place for the 2nd year. The event attracted 22 competitors allowing for a Men’s, Women’s, Juniors and a Mixed Doubles draw to take place. The tournament was held at the St Ivo Outdoor Sports Centre which provided the ideal venue for a family themed tournament. This was portrayed in the matches where a friendly but competitive atmosphere was created throughout the day and it was really pleasing to see a number of new junior players getting involved in the event. Tournament organisers Byron Williams and Faye Kowalewsky did a tremendous job both in preparation for the day and ensuring the tournament ran as smoothly as possible. A special thanks has to go to all who sponsored the event including Superdrug, Just Racquets, and the St Ivo Squash Complex. In the Junior Round Robin Event, Jace Anderson emerged victorious beating Christopher Rej in the final. In the Mixed Doubles event Faye Kowalewsky and Patrick Norman retained their title from last year’s event in a round robin competition. In the ladies event Faye Kowalewsky emerged victorious over Rachael Chapman in a battling display and in the Men’s A event Jonathan Gallacher used some tight, technical racketball to his advantage to take the title, beating a resilient Patrick Osborn. The plate competition for the Mens A draw resulted in Martin Richards seeing off stern competition from Steven Mason and in the Men’s B competition Nigel Strongitharm utilised pin point serving on his way to the final where he overcame Granville Armiger. The Men’s draw B plate saw Mark Dickinson emerging victorious over Gary Mason to take the prize. A huge thank you has to go to all the competitors who took part in the competition, making it a thoroughly enjoyable day for all with the friendly and competitive atmosphere that will hopefully increase the popularity of Racketball in the Region. Byron Williams would also like to extend thanks to Faye Kowalewsky (Cambs Development Coach) for her help and support throughout the organisation and development of the event.